The main entryway is flanked by the dining room and a glazed vestibule, which gives way to the kitchen and living room. Sliding glass doors lead to a sizable terrace, allowing the communal area to expand into the outdoors during warmer months. A third-floor study projects over the edge of the house, providing breathtaking views of the nearby lake. High-efficiency glazing and permeable surfaces on the driveway, entry path, and terrace that facilitate stormwater runoff contributed to the home’s LEED Platinum status. Solar panels produce 80 percent of the power the residence requires. A custom eight-inch-deep rain screen system was designed to reflect solar radiation, and allows moisture to escape with the flow of air from behind the facade’s suspended concrete panels. “As a result, the underlying thermal envelope is protected from direct solar exposure and moisture, preventing water from being trapped in the walls and improving the comfort of the residents inside,” Schmaling says. Harry Bertoia’s iconic Bertoia side chair is surrounded by custom railings. A yucca plant grows nearby, its palm-like leaves celebrating the short but intense summer months in Wisconsin. Custom cabinets and a faucet from Kohler’s Purist collection are complemented by Luciano Bertoncini’s Min table and Spoleto chairs by Knoll. A Paulistano armchair, designed by Paulo Mendes da Rocha, sits nearby. Nestled in the cozy study, Mies van der Rohe’s Barcelona chair and Ottoman sit atop a Spinneybeck cowhide rug from Design Within Reach. A compact custom desk and shelving system makes the most of the available space. Upon deciding to move from Chicago to southeastern Wisconsin, a young family asked Milwaukee firm Johnsen Schmaling Architects to design an unassuming, modern home that reflected their nature-loving lifestyle. The project site—a narrow lot in a historic neighborhood—was flanked by a three-story mansion and a midcentury ranch. The architects responded by creating the OS House: a colorful, unapologetically contemporary residence that thoughtfully embraces its environment. Indoor-outdoor spaces like an elevated patio, shaded terrace, and natural light-drenched vestibule are artfully carved into the bi-level home and connected with sliding or stationary glazed panels, taking advantage of the area’s amazing views. 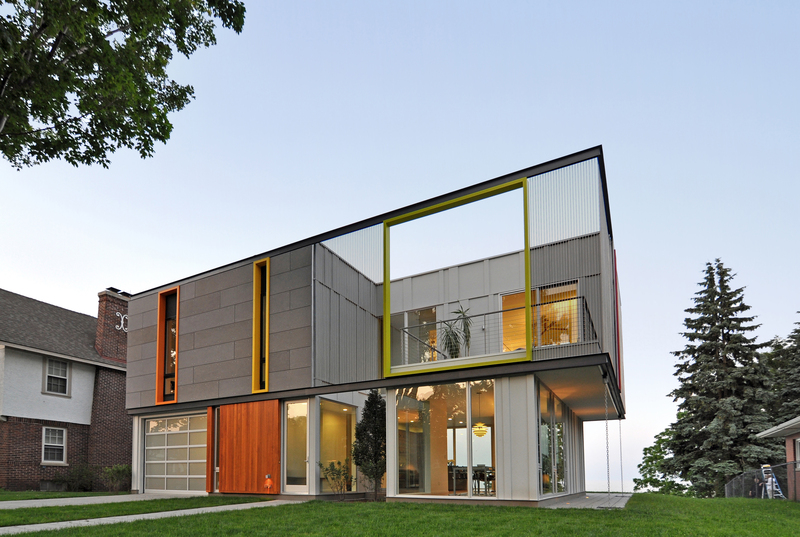 One of the first LEED Platinum homes in the Midwest, the project incorporates green amenities aplenty. Insulated with foam made from agricultural byproducts, the residence has a custom rain screen system, low-flow water fixtures, and a deep-well geothermal heating and cooling system that allows it to operate almost entirely off-the-grid.